Hen and chicks growing succulent of the genus Jovibarba also known as Jovibarba globifera, Hen and chicks perennial evergreen used as ornamental plant, can grow in mediterranean, desert, subtropics or temperate climate and growing in hardiness zone 8-12. 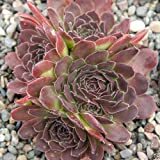 50 JOVIBARBA HEUFFELII SEEDS- HARDY SUCCULENT,Hens and Chicks, Houseleek. 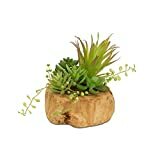 Melrose Lush Artificial Succulent Arrangement in a Driftwood Style Planter 6.5"
Is it necessary to graft or use vegetative reproduction in Hen and chicks? 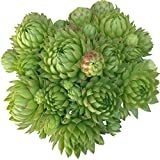 It is possible to grow Hen and chicks indoor? When does Hen and chicks bloom?